Guests treated to all felt so swank. On a lovely late summer day, Dear Husbola and I were invited to the special home of new friends Frank and Richard, whom we have met through our common antiques businesses. Driving Way West of Home we arrived at our two friends' incredible historic home filled with hand picked treasures. What better way to spend the day but with lively conversation and treated to a gourmet lunch served in their whimsical garden. Our entree was a delightfully retro Salmon Mousse--perfect for a group of six antique dealers. Coincidence has it that I have been reading a collection of vintage Edna Ferber short stories--One Basket--and one of her characters in one of her stories dines on salmon mousse in the flagship Marshall Fields. 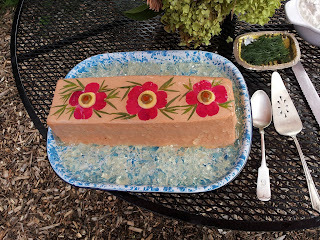 Folks--this was not just any salmon mousse. 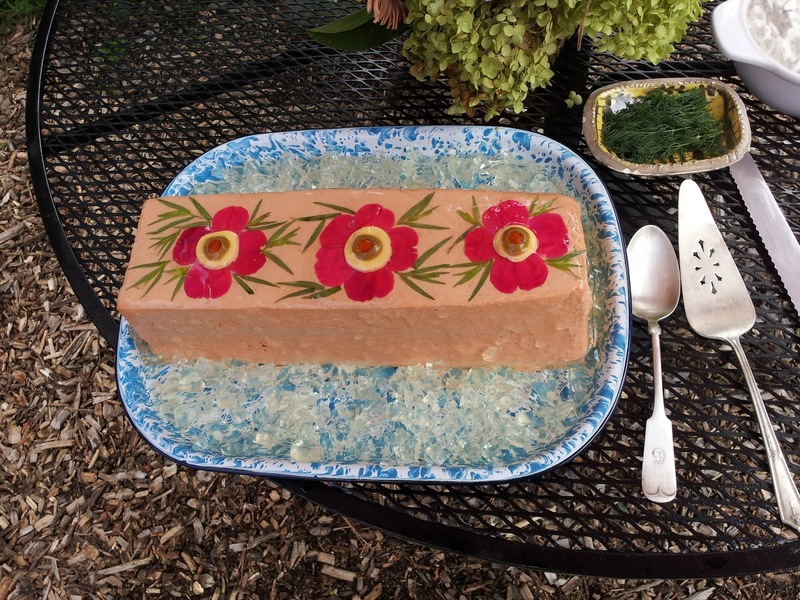 The photo above shows how the mousse was decorated.--with rose petals. The cross section showed equally a lovely with carrot and crab meat I think. 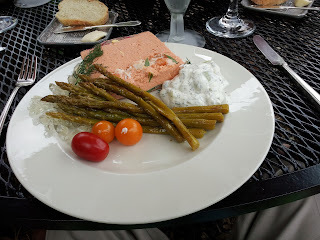 Pickled asparagus and homemade sour cream cucumber sauce, a sprig of dill and garden tomatoes completed the plate. Our party of six make short order of the cool and refreshing lunch. Recipes for salmon mouse are varied indeed. Betty Crocker shows one as well as the Settlement Cook Book. Some use egg yolks, some use cream, some use cream cheese and many concoctions of secret herbs. Some make in a loaf pan, others in fish shaped copper molds. I read that the key is careful preparation, and no hurrying the cooling and the setting in the mold. Crack open a vintage cookbook sometime--the vintage recipes can be some of the most delightful. How did we arrive at the middle of August so soon? It seems like we were just perusing greenhouses for annuals for planting and putting the screens in the windows and doors. Now we have arrived at full on tomato and corn time and if you live in the woods like us--Spiders Are Taking Over the World time. 1. There are farmer's markets and there are Farmer's Markets. My readers from Madison will know exactly what I mean by that. Jewelry, scarves and candles do not belong at a farmer's market. And I want to buy veg and fruit from someone with hands that look like farmer's hands. 2. Stop thinking that if you are stung in your backyard it is from a honey bee. Unless you stand in front of the hive and wave your arms, or open the top of the super and disturb the brood--YOU HAVE NOT BEEN STUNG BY A HONEY BEE! Ground bee, hornet or wasp- maybe--but not a honey bee. 3. Consider stopping listening to commercial radio. I located BBC Radio 4 on my iPad--what a hoot. Gardening shows, world news, women's focus shows, soap operas (The Archer's), chapter a day of books, church service from some cathedral in the UK, quiz shows--something different,. No American political news and no commercials. And no ads for "male enhancement" products!!! BBC London radio is very good too. 4. Schedule that overdue mammogram and colonoscopy. Enough said. 5. Take an inventory of your "free" time. Are you spending it as you would like? Does there need to be some adjustment on the people who you spend time with or if you are too involved in technology? 6. Keep chiseling away at cleaning out your dreck. What summer clothes did you not wear this summer? What kitchen widget have you not looked at in a year? 7. Still can't beat a paper road map. Just think--future generations will never have the pleasure of trying to fold one back up and Never Get It Quite Right! 8. Stop complaining about how humid it is. 9. Visit an antique shop or antique market SOON. (This is supposed to be an antiquer's blog after all!) Nothing beats fresh air, finding a Neat Little Widget (to replace something you cleaned out--see #6 above) and eating some kind of fair food that isn't good for you, but once or twice a year won't kill you. 10. Slow down. Watch a good black and white movie. Make gaspacho. Enjoy the last gasp of summer.